Discover the beginnings of the Baten Kaitos universe in this prequel to the award-winning Nintendo GameCube RPG. With the emperor assassinated and legendary monsters threatening every city, the world lies on the edge of ruin. Only a young spiriter named Sagi and his two brave companions can stop a terrifying new evil from consuming everything they hold dear. *Explore a strange & exciting world, from the high-rises of the Alfard Empire to a land where everything is built from clay, that spans over 60+ hours of total game play! *Leap into the fray with the Magnus card active combat system! Search out & master over a thousand different weapons, items, and armor pieces...then use them to form explosive combos! 06-06-2015 pacpix Box Text A Hero Will Fly Again... 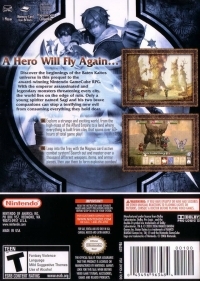 Discover the beginnings of the Baten Kaitos universe in this prequel to the award-winning Nintendo GameCube RPG. With the emperor assassinated and legendary monsters threatening every city, the world lies on the edge of ruin. Only a young spiriter named Sagi and his two brave companions can stop a terrifying new evil from consuming everything they hold dear. *Explore a strange & exciting world, from the high-rises of the Alfard Empire to a land where everything is built from clay, that spans over 60+ hours of total game play! *Leap into the fray with the Magnus card active combat system! Search out & master over a thousand different weapons, items, and armor pieces...then use them to form explosive combos! 06-06-2015 kwisatzhaderach Box Text A Hero Will Fly Again... Discover the beginnings of the Baten Kaitos universe in this prequel to the award-winning Nintendo GameCube RPG. With the emperor assassinated and legendary monsters threatening every city, the world lies on the edge of ruin. Only a young spiriter named Sagi and his two brave companions can stop a terrifying new evil from consuming everything they hold dear. 05-12-2012 disgaeniac Description *Explore a strange & exciting world, from the high-rises of the Alfard Empire to a land where everything is built from clay, that spans over 60+ hours of total game play! *Leap into the fray with the Magnus card active combat system! Search out & master over a thousand different weapons, items, and armor pieces...then use them to form explosive combos! 05-12-2012 disgaeniac Box Text A Hero Will Fly Again... Discover the beginnings of the Baten Kaitos universe in this prequel to the award-winning Nintendo GameCube RPG. With the emperor assassinated and legendary monsters threatening every city, the world lies on the edge of ruin. Only a young spiriter named Sagi and his two brave companions can stop a terrifying new evil from consuming everything they hold dear. 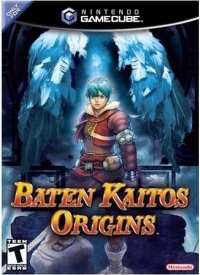 This is a list of VGCollect users who have Baten Kaitos: Origins in their Collection. This is a list of VGCollect users who have Baten Kaitos: Origins in their Sell List. This is a list of VGCollect users who have Baten Kaitos: Origins in their Wish List.